This CD contains every piece that Schumann wrote for solo piano. Included are Album for the Young, Scenes from Childhood, Papillons, Carnaval, Waldscenen, the sonatas, and 3 works with orchestra. 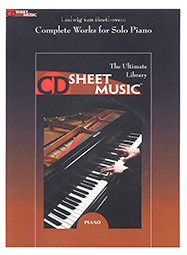 - over 800 pages of music. Robert Alexander Schumann was born in Zwickau, Germany, in 1810 and died in Endenich, Germany, in 1856.